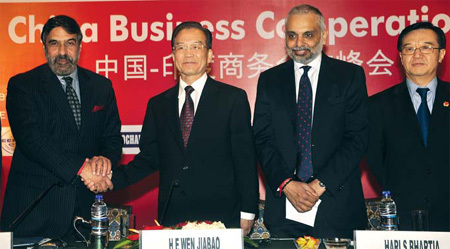 Premier Wen Jiabao (second left) meeting with India's Minister of Commerce and Industry Anand Sharma (left) at a business seminar, during his visit to India last year. The BRICS countries - originally Brazil, Russia, India, and China, and now South Africa - have turned out to be a source of global economic development and essential to future generations. The center of global economic activity is shifting from industrialized nations in the west to emerging economies in Asia, Africa, and Latin America. South Africa joined BRIC at the end of 2010. And Indonesia should be included in BRICS to represent the large developing countries that are increasingly central to global production and consumption. In 2000, the four countries in BRIC (along with Indonesia), contributed just 18 percent of global GDP, while industrialized nations contributed about 65 percent. By 2010, BRIC countries provided more than a quarter of the world's GDP, at 27 percent. The rich countries' share had shrunk to 56 percent. Between 2000 and 2010, BRIC's GDP grew by an incredible 92.7 percent, compared to a global GDP growth of just 32 percent, with industrialized economies having a very modest 15.5 percent. The rising importance of BRICS economies can be seen in the growth of imports. Their import and service demands, at over $2 trillion, accounts for 13.5 percent of global imports, up from just 6 percent 10 years ago. This represents a 277 percent growth in imports. Global growth of imports during the same period was just 92 percent, while imports in industrialized economies grew only 72.3 percent. It is important to note that industrialized economies, especially since the 2008 crisis, have become more protectionist, and have put the onus of global economic liberalization on large emerging countries. The argument used by industrialized nations is that large emerging economies have been eager exporters, but have done little to generate global demand by importing more. But, the data do not support that: The fact is that BRICS imports have grown faster than exports. BRICS countries have also diversified their source of imports and are trading more with other large emerging economies and developing countries. They play an important role in the global economy, and their role in the future of global economics seems more evident. In the area of new businesses, the market capitalization of BRIC companies grew from $1.2 trillion to $6.4 trillion between 2000 and 2010, a massive 641 percent increase. Their companies now account for over 18 percent of global market capitalization, up from a very modest 3.8 percent in 2000. If this trend continues, by 2025, BRICS companies will account for more than half of global market capitalization. Demographic shifts are taking place and BRICS states, especially India and China, will have much of the world's youth, a driving force behind growth of consumer spending and innovation. These countries have large numbers of highly qualified professionals and technicians, and their skilled labor means they will remain competitive across the globe. Their large domestic markets will create economies of scale that make BRICS' geographies central to global production and demand. And they will emerge as centers of innovation and new product development. India-China ties have undergone a significant change in the last two decades: They are broader and with more substance. A key element of that is the economy. China has gone from insignificant player to India's largest trade partner with, $62 billion of goods traded in 2010. Indian manufacturing and IT companies are making serious moves in China, and demonstrating their ability in high-tech engineering, software development, banking and foreign exchange trading. Chinese companies have an impressive export record and have emerged as important suppliers for infrastructure projects in India. During Chinese Premier Wen Jiabao's visit to India in December 2010, he and India's Prime Minister Manmohan Singh set a goal: bilateral trade should reach $100 billion by 2015. This shows that their cooperation has entered a vigorous and fruitful "new period". Mutual investment is on the rise, and should bring benefits to both. China and India also have a strong natural resource base. And, with Brazil, they have more arable land than Europe and North America combined, and with better productivity, have the possibility of meeting more than half the world's food needs. They are crucial to future global food security. BRICS countries will need to work together closely to evolve strategies for the future. This could include cooperation in a wide variety of issues like energy, food security, access to natural resources, climate change, global governance, and international trade policies. What is essential to maintaining this wide-ranging cooperation is for BRIC countries to have a stake in each other's economy. And increasing trade and business relations among them is a major part of that.